Wandering through the stony maze of Barcelona’s old city center, coming across picturesque plazas, historic churches, and charming cafés, you might start to feel like you’re in a fairytale. Perhaps it won’t come as a surprise, then, that this bewitching area of the city is home to lots of supernatural tales about Barcelona. 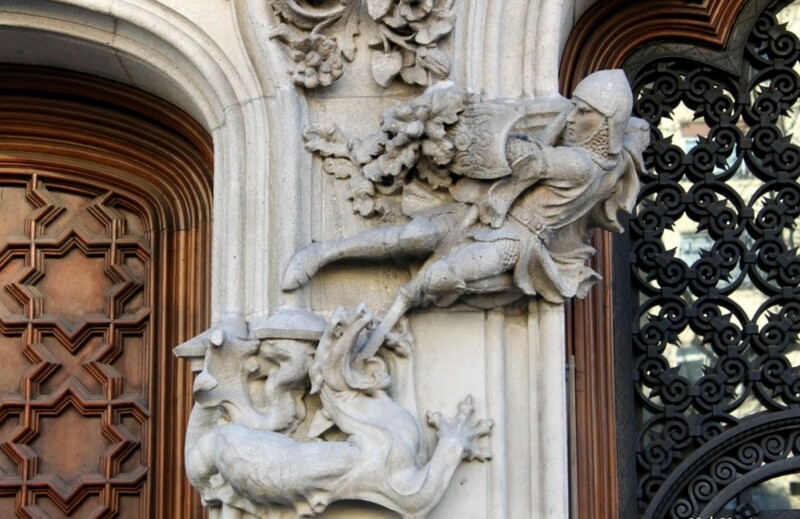 From wicked witches and dragons to enchanted fountains, here are some of the most captivating Barcelona Gothic Quarter legends that have worked their ways into the very walls of the city. Give this little turtle a pat and you’ll get good luck! You’ll find him perched on the wall outside the Casa de l’Ardiaca, which is just outside the cathedral on a peaceful side street. The stone rectangle he’s on was originally a mailbox. As cute as the animal sculptures are, this is actually a story about the justice system – fitting, as the building once housed the Lawyers’ Association! 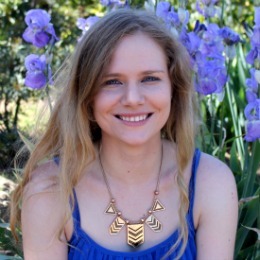 There’s a sword for justice and birds to represent the ideal of justice as free and unbiased – but also a tangled web of ivy and a turtle that reference the often slow, difficult processes of justice. Inside the Casa de l’Ardiaca, you can view different exhibitions and public archives, plus a piece of the original Roman aqueduct that ran through the city centuries ago. There’s also a beautiful patio in the entryway and an upstairs terrace with great views of the gargoyles on the cathedral. You might know Barcelona’s patron saint Sant Jordi better by his English name, Saint George. He’s plastered all over Barcelona if you know where to look. The giveaway clue that you’ve found a Jordi is that he’ll be stabbing a dragon. The Gothic Quarter is home to a whole host of statues of Sant Jordi, including one on the postcard-perfect Carrer del Bisbe, a big one on the front of the government buildings in Plaça Sant Jaume, one inside the cathedral’s cloister, and even a tiny little one on a back street by a rowdy Irish pub. There are occasionally more subtle nods to the legend of Saint George elsewhere in the city, like the shimmering rooftop of Gaudí’s Casa Batlló, said to be inspired by the skin of the dragon. If you’re in town on April 23rd, make sure to see the beautiful celebrations for the Diada de Sant Jordi, which is the most romantic Catalan holiday of the year! 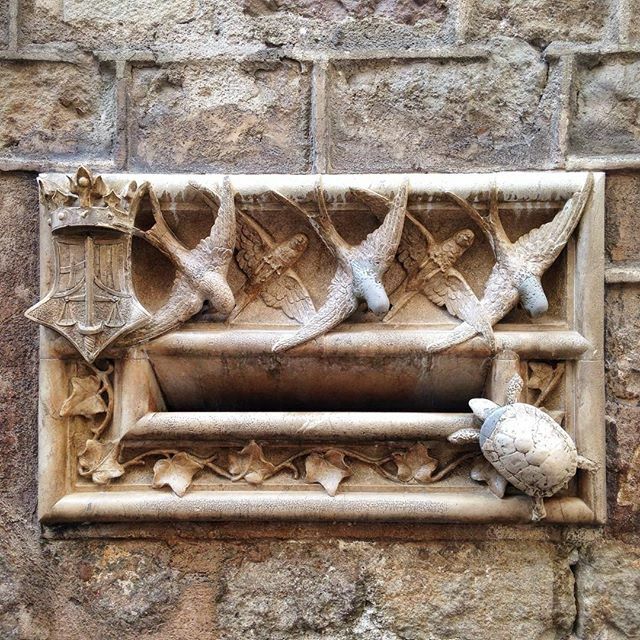 The quiet, shaded cloister of the Barcelona Cathedral is home to a gaggle of 13 geese. They’re not there because the clergy are animal-lovers; they actually represent one of the more tragic tales in Barcelona’s history. Santa Eulalia is the other patron saint of Barcelona (along with Sant Jordi). She was a martyr during Roman times, and killed at the age of 13. Some versions of the story say she suffered 13 tortures, one for every year of her life. 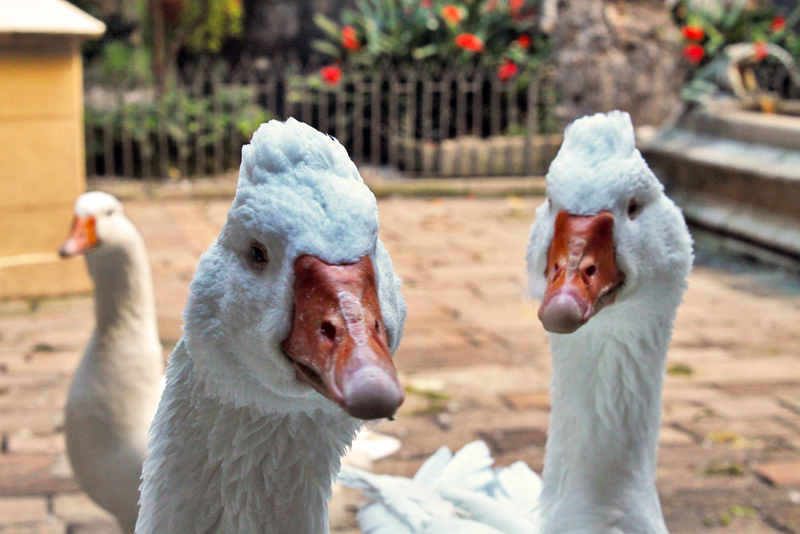 Today, the 13 geese are housed in the cathedral as a nod to the saint. If you visit the cathedral, consider going before noon or late in the afternoon, because you can get in for free then! 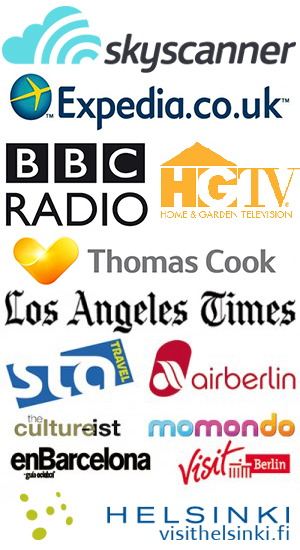 The hours vary slightly by day, so check on the website before you go. Also, don’t mix up the Barcelona Cathedral with the Sagrada Família! Lots of visitors assume the Gaudí piece must be the cathedral as it’s by far the most famous church in the city, but the real cathedral is in the Gothic Quarter. What if you could instantly guarantee a trip back to Barcelona with one simple step? It sounds like an infomercial scam, but it’s actually one of the city’s most beloved superstitions. The fountain is also where fans of FC Barcelona come to celebrate after victories, chanting and waving Barça flags around. That’s because there used to be a newspaper office here, which had a chalkboard outside where the scores were posted. The offices don’t exist anymore, but the tradition still does! 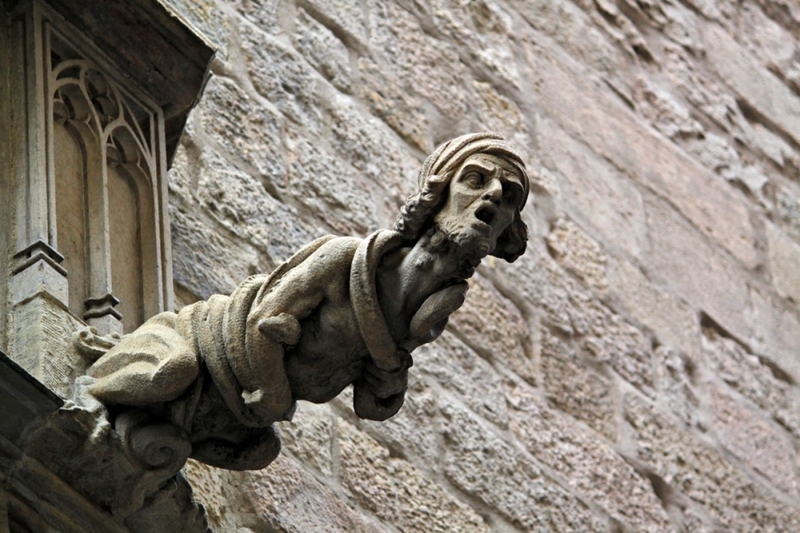 There are tons of different gargoyles jutting out from the walls of the cathedral, including lions, unicorns, elephants – and some that are supposedly witches petrified as monstrous figures for eternity due to their wicked behavior. That behavior was spitting on the Corpus Christi processions as they went by. As a fitting punishment, these bewitched figures now serve as plumbing for the cathedral. They do actually “spit” today, in a way. On rainy days, they serve as waterspouts and shower unsuspecting pedestrians with torrents of water – so look out below! 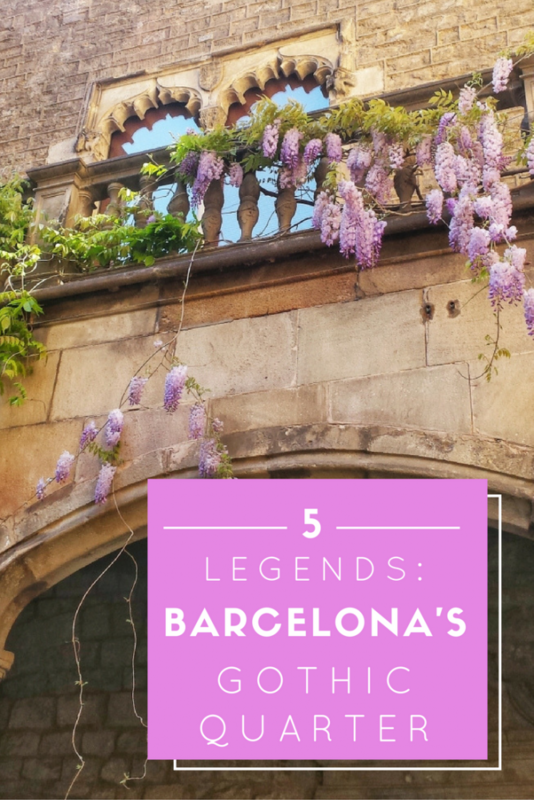 Which one of these Barcelona Gothic Quarter legends do you like the best? Thank you to Barcelona Turisme for helping me learn more about the city’s wonderful history of legends and myths! I love them all but the spitting witches are intriguing! hard to choose a favorite but I like the fountain. I saw the geese on my last visit. that’s where the tiniest bathroom I’ve ever been in was! in that cool cloister. I’m going to look for the gargoyles when I’m there next month. can’t wait!! Interesting Legends, thanks for share them. I got to spend a day in Barcelona last year thanks to a missed flight connection and seriously considered spending that time in the Gothic Quarter. (I went to Sagrada Familia instead.) Next time! Excelent!! 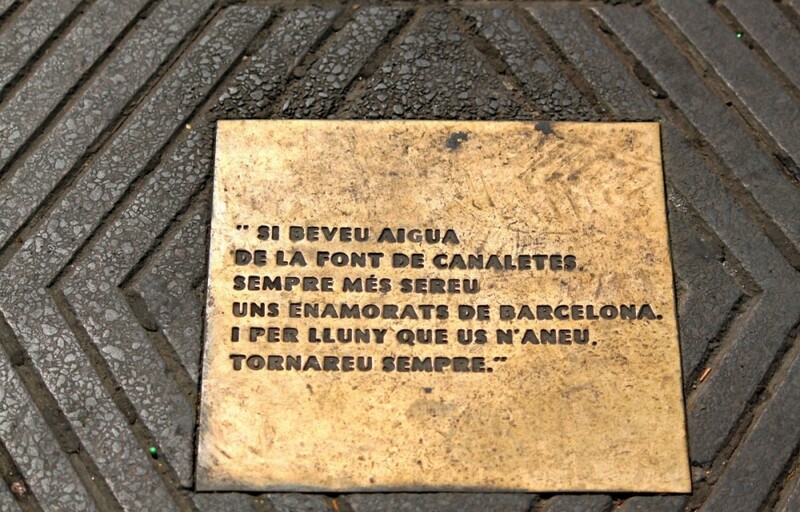 Barcelona is full of stories and myths like these. Ooh thank you very much! 🙂 I always think St. Jordi is on the 24th haha – not sure why.